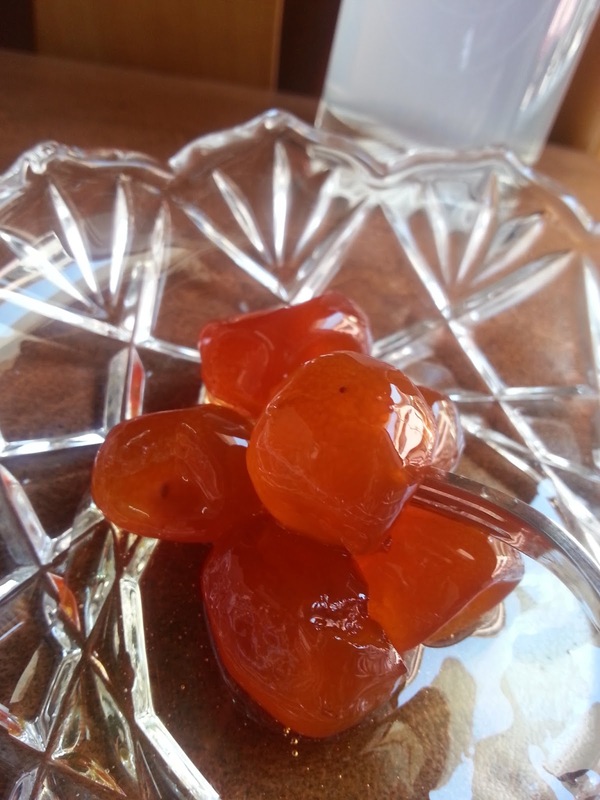 Kumquats teaspoon sweets are also known as glyka tou koutaliou, glyka means sweets, koutali, means spoon. Kumquat is also pronounced in Greek Koum Kouat, it's not only a traditional product of Corfu but a trademark of Corfu, Greece. They were bought to Europe by a botanist by the name of Robert Fortune, sometime in the 18th or 19th century from China. There are four kinds of Kumquats.Since 1924, they have been harvested in the village of Nymphes, located in the Northern part of Corfu. In fact, corfu is a major exporter of Kumquats, tons are produced every year. This delicious fruit is similiar to an orange just quite smaller, they're the size of Kalamata olives. Kumquats can be eaten raw ( including the peel) but are also used in various cooking recipes, click the link for the recipe, Kumquat - Gourmet Pasta Sauce. They have a distinct bittersweet but tangy taste. Corfu, is mostly known for its Kumquat Liqueur, my favorite. Kumquats are macerated in clear spirits such as vodka and brandy.This tiny citrus fruit may may be smaller but are still filled with antioxidants, loads of vitamins and health benefits. Such vitamins include vitamin A,C and E. When eating the fruit raw we are protecting our body from diabetes,cancer, degenerative diseases and various infections. They are also known for relieving hypertension. The peel of the the Kumquat is loaded with in essential oils, fiber and anti- oxidants. Follow my steps, to prepare a yummy Kumquat teaspoon sweet. This traditional recipe was given to me by my dear friend Maria who has a Kumquat Tree in her backyard. 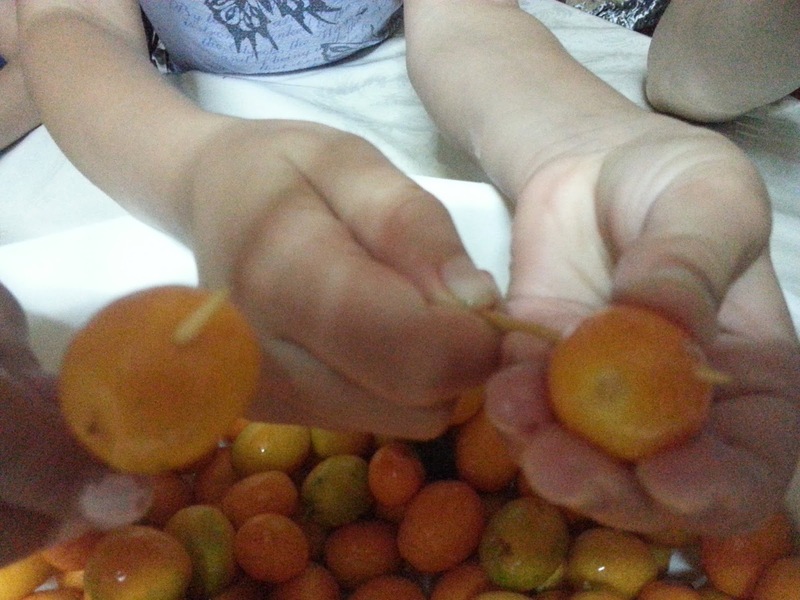 1) Take a toothpick and puncture about 6 holes in all your kumquats. When done place them in a pot or container, like I did. Cover them with water for about 8 hours.This procedure helps remove all the bitterness, I usually let them sit overnight. 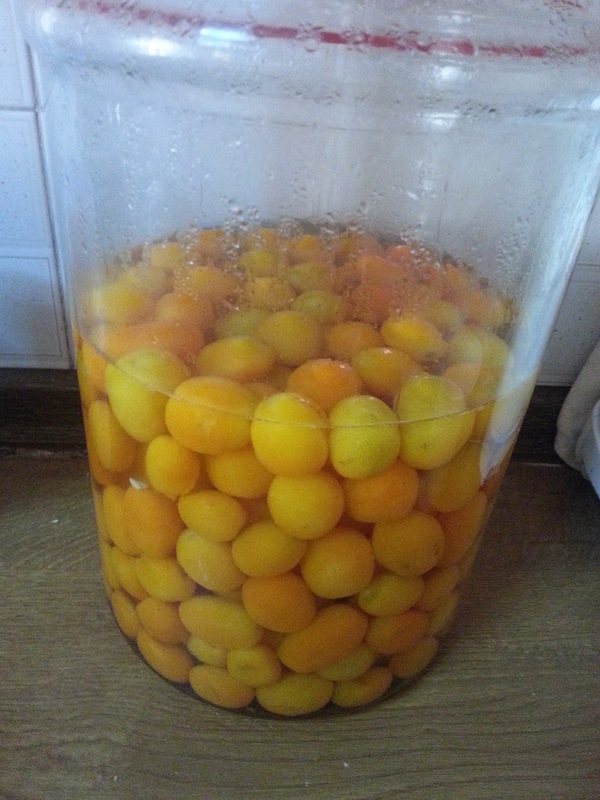 2) The next day we drain them, fill a pot with water and add the kumquats. We boil them on high heat for 5 minutes. When done, drain them again and repeat the process with new water and boil them for 8 minutes. We remove the kumquats with a straining ladle and place them in a container with cold water, to give them a shock and remove the bitterness. 3) Drain them and then place them in a container (use the container that I did very convenient) with new water, allow them to rest for 24 hrs, changing the water every 6 - 8 hrs. 4) When done with the above process, drain them again, then place them in a pot with water and boil them on high for 3 minutes. Don't over boil them. When done drain them and fill a container with water, squeeze half a lemon inside the jar, place the kumquats inside and allow them to rest for 1 hour. This is how they should look, if they crack, it's ok.
5) After one hour drain them, place them on a towel so they can dry out for about 3 - 4 hours. 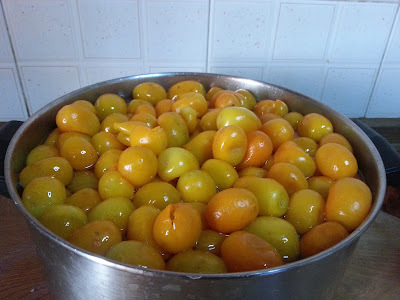 6) In a big pot, add your water and sugar, let it boil on high heat for 10 minutes then add your kumquats and allow them to boil for another 10 minutes. Depending on how tender you like them you can take them off the stove or boil them until your are satisfied.I boiled them for 30 minutes, add your vanilla extract or powder.When done take them off the stove and add 1 tablespoon of fresh squeezed lemon juice. 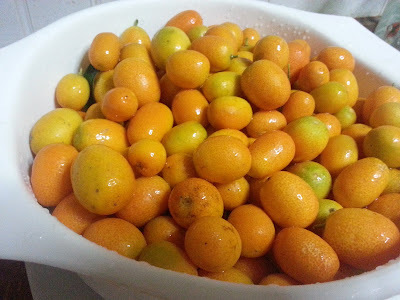 7) Wet a towel and cover the pot shaking every now and then so your kumquats will not shrivel and lose their shape. 8) Allow your kumquat teaspoon sweet to cool for eight hours, if after the eight hours the syrup is not runny it's ready, if it's runny you need to boil it for a few minutes. *TIP syrup is ready when you are able to drip drops unto a small plate. 9) Place them in an airtight jar and you can have it all winter long. KALE OREXI !!! 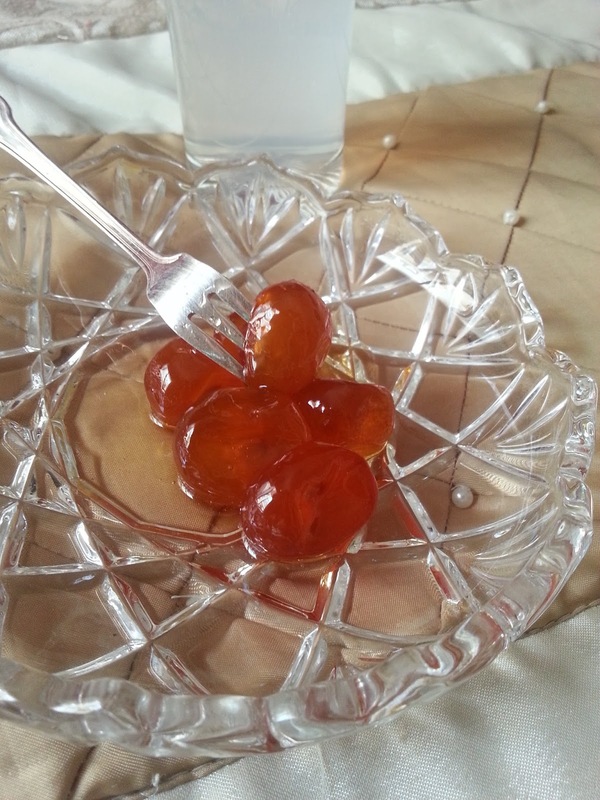 You may serve your kumquat teaspoon sweet with a glass of cold water infused with ouzo! !